Full disclosure: I love old-school beat'em up games. I grew up with an unhealthy addiction to Double Dragon, Final Fight, TMNT and Ninja Gaiden. These games and their ilk ruled the arcades in the '80s and '90s. With the arcade scene near extinction today, it would appear the beat'em genre is also on its last legs. Having mutated its DNA to thrive in other specialty genres like the hack n' slash action-adventure, the classic formula of walking through alleyways and elbowing endless mobs of thugs in the face has all but disappeared from the gaming zeitgeist. This is why I'm all the more thankful for the arrival of Watchmen: The End is Nigh (W: TEIN) to the Xbox Live Arcade catalog. In time-honoured tradition, developer Deadline Games was tasked with rushing out a game to tie-in with a major motion picture release. As if that wasn't a tall enough order, they had the unenviable challenge of cramming some very heavy, intricate source material into a simplistic and creaky gaming genre. In short, the first video game ever made of the most influential graphic novel of all time is a straight up mindless brawler. Fans of Alan Moore's seminal graphic novel may cry blasphemy and even newcomers to the Zack Snyder film may find this an odd approach given the more mature, unorthodox tone of the Watchmen universe. And looking at it from a strictly gaming perspective, beat'em ups have never acquitted themselves well to being on the forefront of innovative deisgn. Yet despite the unfavourable circumstances surrounding it, Deadline Games have managed to concoct a fun, albeit short-lived action romp through the bleak cityscapes of an alternate reality New York City. W: TEIN competently pays respect to all the tropes you'd expect out of a standard side-scrolling street brawler. More modern touches elevate the proceedings in the form of absolutely gorgeous graphics. These visuals rival anything available in retail today. They are of such high quality that I wondered whether they were being wasted on a mere brawler. Why not go old school in a different direction and make a point-and-click adventure game in the tradition of those old Sierra or Access classics? Perhaps a missed opportunity that is unlikely to ever bear fruit, seeing as how the content requirement of an adventure would put it out of the scope of an XBLA release. Oh well. 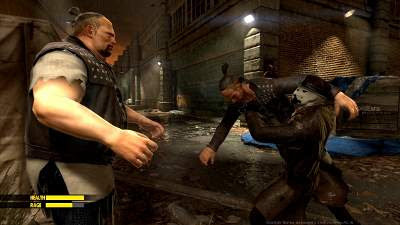 On the upside we have what is arguably the most beautiful street beat'em up you're likely to see for years to come. On the gameplay side of the equation, W: TEIN keeps its ambitions small but squares away most of the basics. Linear levels, easily dispatchable baddies and a drawn-out boss battle are all here. Special attention has been placed on the discovery of unlockable attack combinations and upgradeable special abilities, such as Rorschach's Rage meter. In practice, combos have questionable value since you're given very little breathing room to complete every strike before an assailant sucker punches you from behind. You'll soon learn that the counter-attack technique reigns supreme and it often renders even the most damaging combos obsolete. Enemies who are nearing death will show a random button icon above their heads. Nailing the designated button press when close to these hapless thugs will trigger one of several canned finishing moves. Similar to the Obliteration Techniques seen in Ninja Gaiden II only far slower to allow you to fully savour your kill, these are by far the most satisfying aspects of Watchmen's combat. Of course, repetition does rear its ugly head, as is the fate of all skull-cracking adventures. Enemy skins change between chapters but their behaviours remain fairly static. The same can be said for the environments. As detailed and well-realized as they are, they're all just pretty backdrops sprinkled with levers and locked gates. Ironically, when the game tries to add variety, it falls flat on its face. The few environmental puzzles are laughably simple to the point of being a time-waster. Meanwhile, there's a nifty lockpicking mini-game that works pretty well on its own but feels totally out of place. For better or worse, W: TEIN is extremely short and predictably so seeing as it is just the first installment in a planned series of episodes. A single play through will last no longer than four hours and that's a very conservative estimate. Ultimately, the attractivness of the package will hinge on your liking for this style of game, as well as the availability of a willing friend to play the game with in the couch co-op mode. Speaking strictly dollars and cents, it's not quite worth the $20 (1600 Microsoft Points), but I really enjoyed my time with it and can see myself doing it all over again at least once more. I am horribly biased towards these games, as I've already confessed, so take my generous assessment of Watchmen: The End is Nigh with that in mind. There's nothing here that screams "must buy" but what I see so far is encouraging. Given some more time back at the lab, I can imagine Deadline Games learning from their mistakes and making an even better product for the next Watchmen episode.